The Denarius II is a double cup headphone. This headphone also offers a snug but comfortable fit. 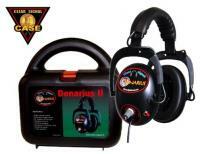 The high quality shells reduce the ambient noise up to 20 decibels. The comfortable padded plastic headband is adjustable in height. Also this model has a single volume control which both speakers evenly tune in volume. The volume control has 41 stay put segments for a perfect adjustment. A polarisation switch makes the headphone compatible with other detectors without having to use adapters. This headphone is also equipped with a shielded ear - to-ear audio connection so that no interference occurs. The special designed curly cord has a compact inner core and is equipped with a 90 degree angled waterproof 6.35mm stereo jack. The outer shell of the spiral cable is made of PUR to make it very strong. The Denarius II is a compact yet powerful set of headphones with single volume control. ► The strong polymer ear-shell gives a complete surrounding of the ear. ► Soft comfortable ear cushion to avoid the slip down of the headphone. ► Single 41 click volume control, with stay put segments for a perfect adjustment.